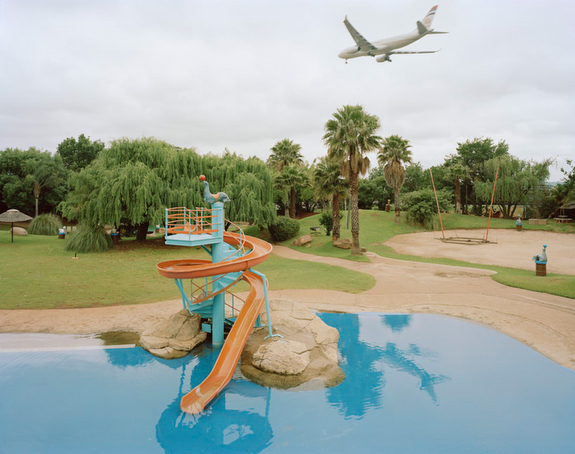 This body of photographs, titled Separate Amenities, examines the way in which the landscape was constructed to enforce separation, in the form of separate amenities, during the time of apartheid in South Africa. The recreational spaces I have focused on previously functioned as separate facilities for different racial groups on every level of society, including separate beaches, parks, walkways and swimming pools. By exploring this recreational landscape, constructed through political, social and psychological factors, a view can be obtained of how the physical structuring of the landscape has been altered to implement control and separation. It reflects a level of social engineering, through a flawed political system of racial segregation, which has led to spaces of ambiguity, incongruity and ultimate failure. This reveals the many ways in which ideology has shaped our landscape and comments on the fact that despite the failure of apartheid, the structuring of the landscape in South Africa has had a lasting affect, which as Okwui Enwezor said is “an entirely unique specimen of the historical failure of moral imagination” in South Africa.